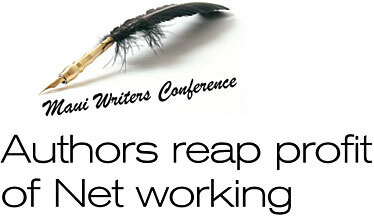 John Carter addresses a seminar at the Maui Writers Conference with advice on how to take a concept and capitalize on the Internet marketing possibilities. Personal coach, consultant and author Sam Horn stood in front of the small but packed room at the Ala Moana Hotel at the Maui Writers Conference over the holiday weekend and told the story of a man who became an expert in stock trading, wrote a financial book called "Mastering the Trade" and made about $45,000 from his advance and royalties. He even hired a publicist for $25,000 to help promote his book. 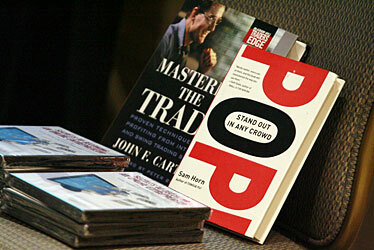 Books written by Carter and Sam Horn, including "Mastering the Trade," Carter's first. But the results left him dissatisfied. So he started a membership Web site to share his aptitude with people who were willing to pay for what he knew about the financial market. Within a couple of years, he made more than $1 million from subscriptions alone, and $879,000 in product sales. That man is John Carter, who teamed with Horn at the Maui Writers Conference this year to lead the six sessions of IDEApreneur, a new seminar track at the conference geared toward writers and business people. "What I like about what (Horn) is doing is that she's hitting the idea that writing is wonderful ... but you need money, too, and it's not a bad thing to think about that," said Anupy Singla, a business journalist from Chicago who attended graduate school at the University of Hawaii and is working on an Indian cuisine cookbook and a pilot for a cooking show. Furthermore, Horn promotes the concept that "it's not presumptuous to call yourself an expert if you're presenting your material in an honest way," Singla said. "Don't sell yourself short by giving away your talents for free. It's amazing how much need there is out there for your knowledge." Find something you know a lot about "that makes a difference for others and a prosperous living for you," Horn said. Then hone that message. What are the three most startling points? What takes exception to current knowledge? Would people buy this new wisdom because it's not already in their bank? Many will pay for value and tangible information online, because they want it right now. They don't want to spend time searching for it. She also detailed the potential value of e-books and special reports sold online. Look for a niche. Carter's book continues to sell about 10,000 copies a year because of his Web site, www.tradethemarkets.com. Those aren't huge numbers, but in the genre of online trading, for instance, the book is No. 1. "In my little pond, my book is out there and people are reading it," he told the group. But the topic doesn't have to be so serious: A friend of Carter's makes more than $600,000 per year running a membership Web site for Texas Longhorns fans. There's even a needlepoint site that generates $90,000 to $120,000 per month in revenues. Be innovative. Carter and his wife wrote and videotaped a woman singing a parody of Carrie Underwood's "Before He Cheats." The song, titled "Before He Trades" - hilarious to traders who understand the inside jokes and lingo - garnered attention on YouTube and drove traffic to Carter's Web site. Construct your Web site carefully. Carter said it's "completely useless" to run a site that doesn't capture names. That means requiring people to sign in before they can access your material - even when it's free. But it's not about amassing millions of people. "I don't want the biggest list," he said. "I want the most focused list. If they're not willing to provide their e-mail address (which is not shared with other companies), then good riddance." He also discussed methods for verifying those addresses so people don't provide fake ones. Provide solid content with integrity. If you charge people to access your Web site, it shouldn't contain advertising. They're paying for the information and the freedom from annoying pop-ups. If you have quality material and a site worth perusing, it works. Carter's collected $135,000 in subscription fees for the month of August. "I've done the math, and I've found that you can live on that," he joked. "Whatever you think you can make in a year, you can make in a month." Forget fancy sound and movies. People want simple, straightforward information. Besides, you might want to research how well search engines detect sites that launch with such embellishments. Carter reports that the results aren't good. 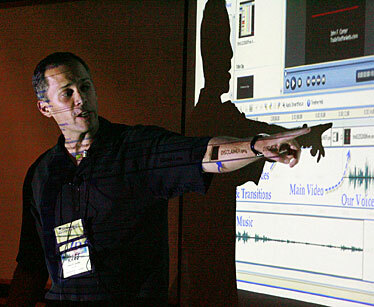 Create new ways to present your material. Rather than speaking in person at seminars, Carter has started offering Webinars. He charges $500 per person. For some of these workshops, up to 600 people have signed up. He incurs no cost or strenuous travel, and gets to stay home for dinner with his family. Include discussion forums. Previously, Carter spent several hours each day answering individual e-mails from subscribers. Now he withholds his e-mail address. Instead, he asks subscribers to post their questions on the forum. When he answers, he often takes care of many inquiries simultaneously, and at times his loyal subscribers beat him to it, offering a solution before he even gets to it. This takes about 20 minutes per day. You can make a good living with the right material and strategy. But that's only part of the picture. Making a difference is essential. As Horn reminded the audience, "You can change a life in one page."